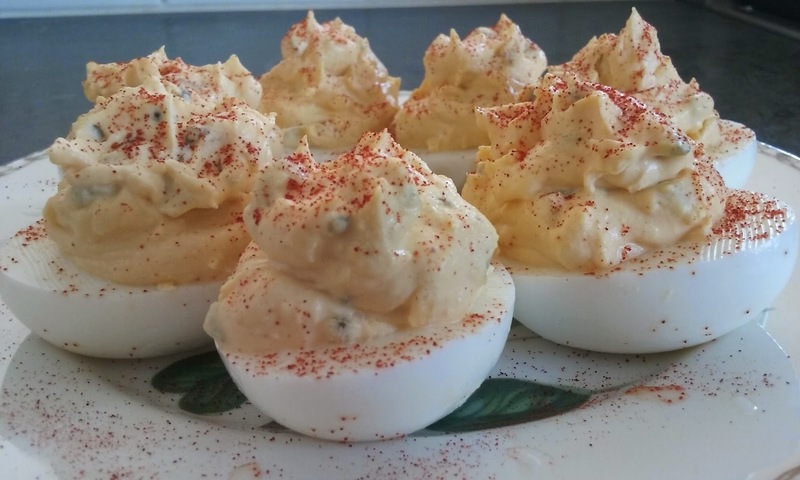 Have you ever gone to a party, picnic or barbecue where someone said they were bringing deviled eggs, and you're excited as they don't appear very often, only for you to see them and they have a scant spoonful of filling I them? 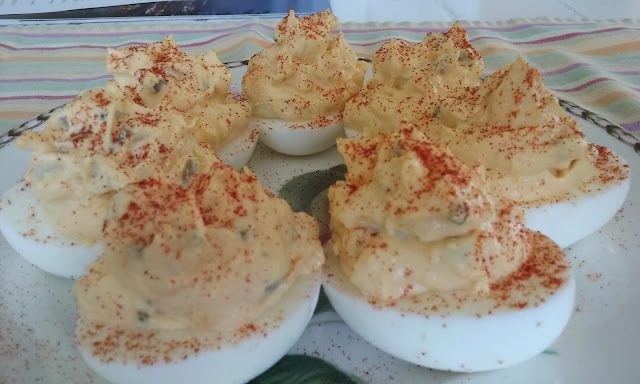 I love deviled eggs, but just like my cupcakes, where I like at least an inch of frosting on top, I like a lot of filling in my egg. 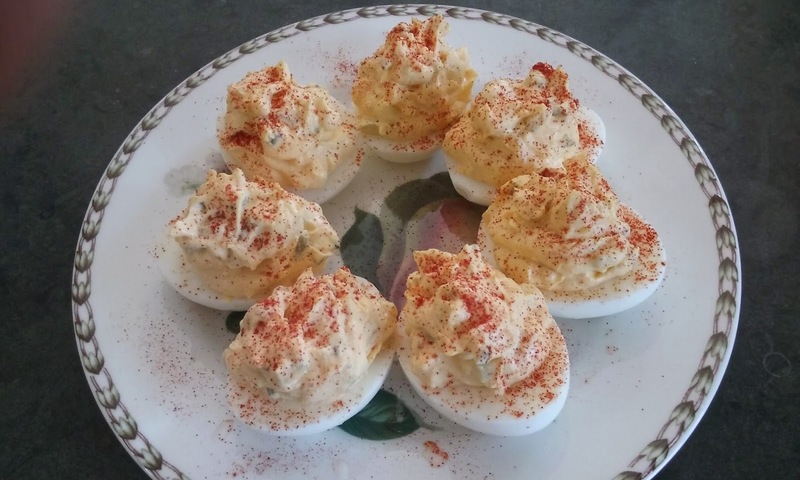 Deviled eggs are so simple to make and I think the only issue people may run into is cooking their eggs too long where the yolks turn green. Tip..bring your eggs to a boil, then cover, and turn off heat. Let them sit for 15 minutes, the drain water from pan and put eggs in a bowl of ice water with the cubes of ice still in the water. The eggs are pretty hot, and will need the addition of the ice to cool them down. Boil eggs according to method above. Shell eggs and rinse well...the one thing you don't want is a shell in your deviled eggs. Using a cutting board, cut eggs in half with a sharp knife. Put all yolks in a bowl. Your yolk should be a beautiful yellow, with perhaps just the slightest touch of soft yolk in the center. If this is the case, you've done a great job. You will have 20 halves, and will be using the prettiest 16 you have, giving you two extra yolks for the filling. Discard the 4 other egg whites. Put all of your filling ingredients in a medium bowl. I use a hand mixer for this, blending the yolks first to get them mashed, then the rest of the ingredients. Taste for seasoning...does it need more pickle, more salt, more mayo? Spoon filling into each egg and place on a pretty platter. Sprinkle with more paprika. Bon appetit! I was quite taken by surprise when one of my friends on Facebook asked if I made a good flan, or the fancier name being crème caramel. The "quite" because I had never made one. Being up for the challenge, I bought the ingredients, played around with many recipes, and voila, crème caramel. Now it was Harry's turn to be taken by surprise because I texted him to say I had made it, and it was in the fridge setting...could he pick it up tomorrow, being this morning, which he did. 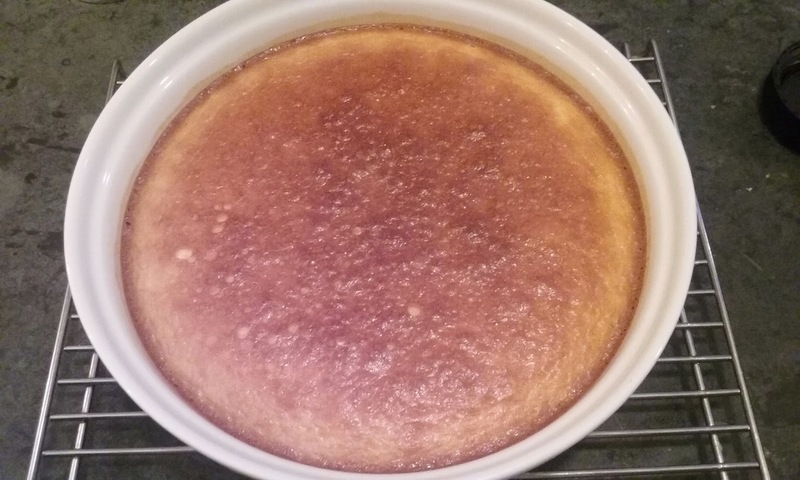 Even though I could only scrape the little that was left around the side of the pan with some of the caramel, I was really pleased with the way it turned out, and the delicate Irish Cream flavor it imparted. 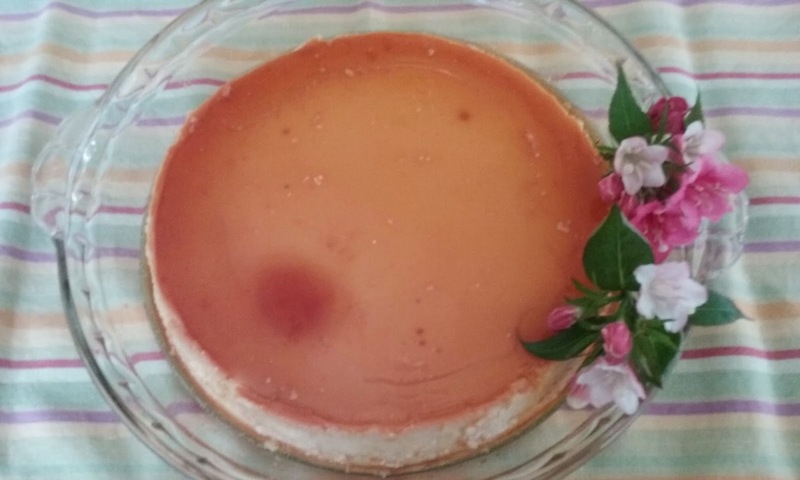 The cream cheese also makes the flan not so eggy-tasting. I was happy, but Harry even happier. 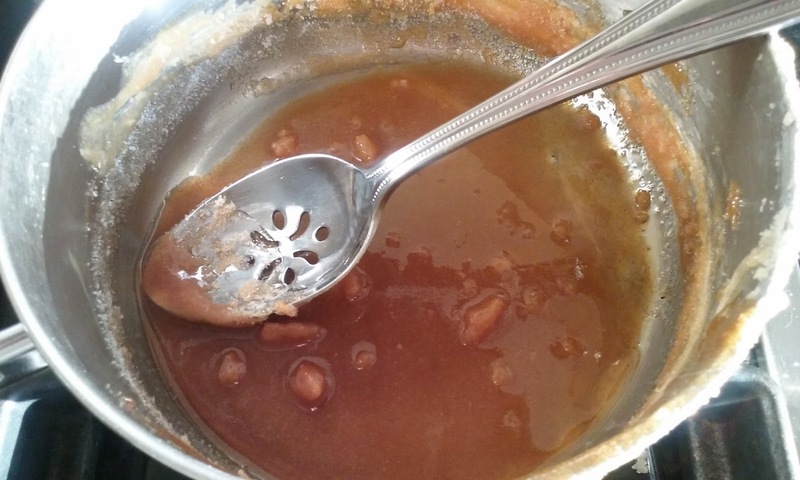 The only thing I have to say, though, is that making the caramel should be a no brainer...you don't use a candy thermometer on this one as there's only 1 1/4 cup sugar to deal with. But you have to be vigilant as not to burn the caramel, which means standing close to the stove and not stirring but swirling the melting sugar as it browns. 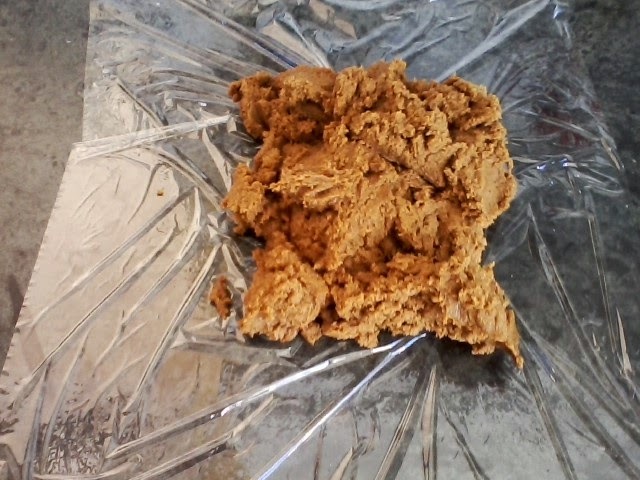 I made the mistake of using what I thought was a heatproof scraper, one of my favorites, I might add, only for it to turn into a shape of art after I put into the caramel. Oh well...this is a great alternative to a cheesecake, and doesn't take long to put together, so give it a whirl. In a heavy saucepan over medium low heat, combine the sugar and water, and stir for a minute or two. Then continue to cook without stirring, occasionally swirling pan as sugar melts and starts turning golden...the whole process should take about 12 minutes. Quickly pour into a round 2 quart casserole or if you don't have one, find something similar that's oven proof and will fit into a larger pan for baking. Let cool for 10 minutes while preparing the custard. I beat the cream cheese and all the eggs in my nutri bullet. You can also use a blender. I then pour this mixture into a bowl and add both milks and the irish cream, whisking to blend. Pour over the caramelized sugar and place in the larger pan. Pour boiling water into the larger pan to one inch. Bake at 350 for about 50-60 minutes, until the top is brown and center is just set...yes, it will jiggle. Remove casserole from larger pan and cool on a rack for an hour. Place in the fridge for at least 8 hours up to overnight. Unmold by running a knife around the edge and inverting it onto a large RIMMED platter. 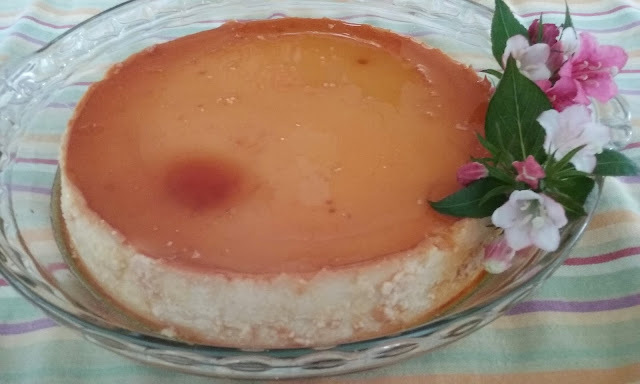 Do not use a flat platter as some of the caramel will be liquid and you want all of that to spoon over the flan when you serve it. Bon appetit! if you continue to use a spoon to stir, the caramel will harden on the spoon, as shown here. you just want to stir until the sugar and water are mixed together, then swirl as it browns. I love potato salad, and took it over cole slaw every time when I was growing up. Back then potato salad was nothing more than cut up boiled potatoes, perhaps a little celery and mayonnaise. 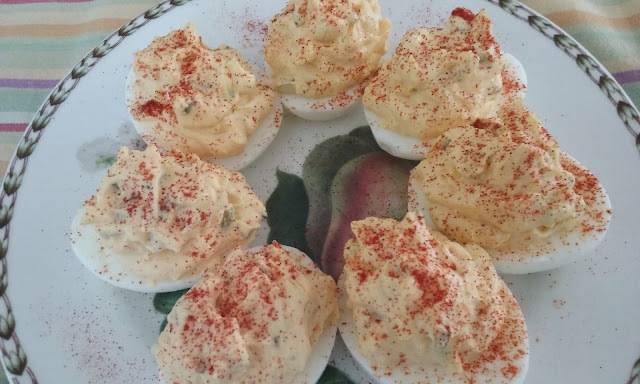 I usually prefer not to have my potato salad swimming in anything, whether it be mayo or sour cream. As with my chicken salad, both are used as simply a "binder" to bring everything together. I have made this salad time and again, and for a number of years when my late husband, Curt and I, went to our friends, Eve and Richard's house. 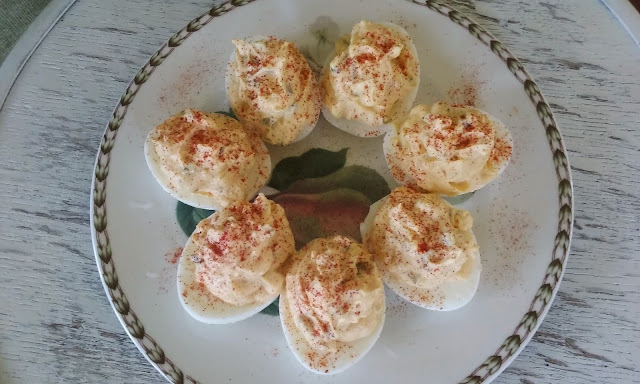 Richard doesn't like paprika, but to me it's sacrilegious to not have a dusting on the hard boiled eggs on top of the salad, so we sort had an agreement...I would go light on the paprika and he would barbecue my hot dog until it just about turned black. 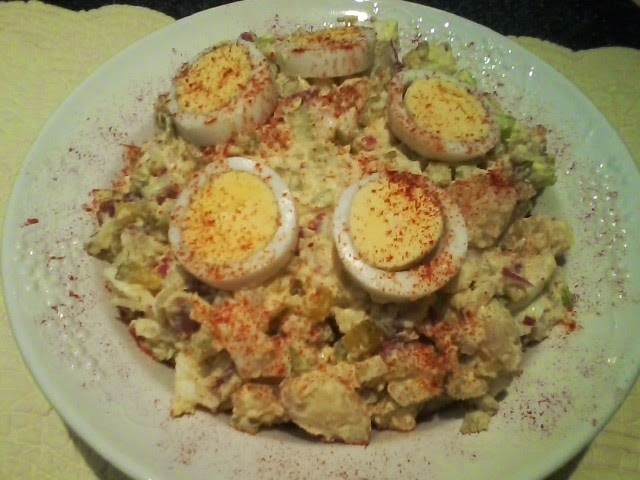 I made this potato salad when I visited my brother, sis-in-law and nieces, to accompany the sloppy joes I made for dinner. This recipe is dedicated to Alex and Abs! 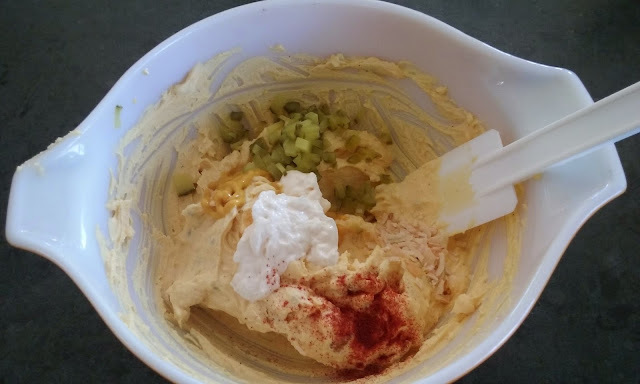 I make this easy on myself and add the sour cream, mayo, mustard and salt in a medium bowl and whisk until blended. Then I put the potatoes, onion, celery, pickle and the 5 chopped eggs in a large bowl. With the eggs, you can add just the whites, whatever. I usually add the 5 whites and 1 yolk. The 6th egg I slice and put on top for presentation. By mixing the mayo/sour cream/mustard in a separate bowl, you have control over how much you want to put on your potato salad. Sometimes I may not use it all, but I think you would like to err on the side of putting in not enough at first, than too much. Then see if you want to beef up any of the ingredients....more onion? more pickle? go for it. Once you have fine-tuned everything, make sure it's all incorporated. 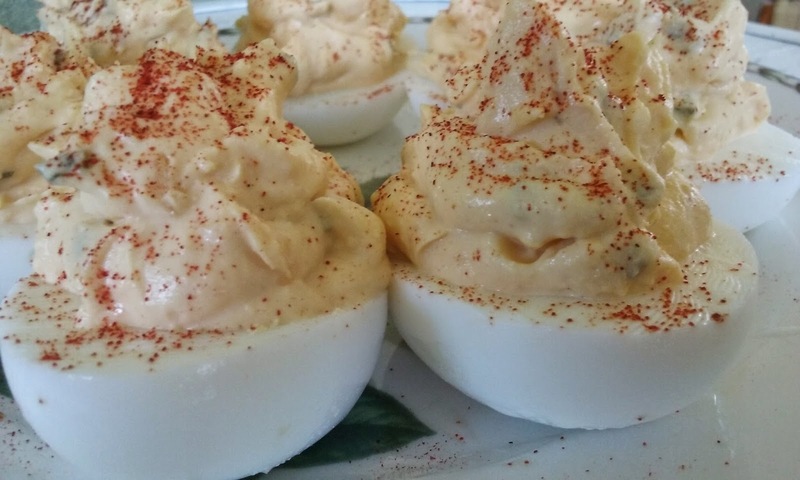 I usually put in a decorative bowl, then place the sliced egg on top, with a dusting of paprika. Chill for at least 2 hours. Bon appetit! There are many, many Bolognese sauce recipes out there, but no matter which one you look at, they all pretty much have a list of 15-20 ingredients. I like making it every once in awhile, and because of all of those ingredients, you get a sauce that is complex and has depth. 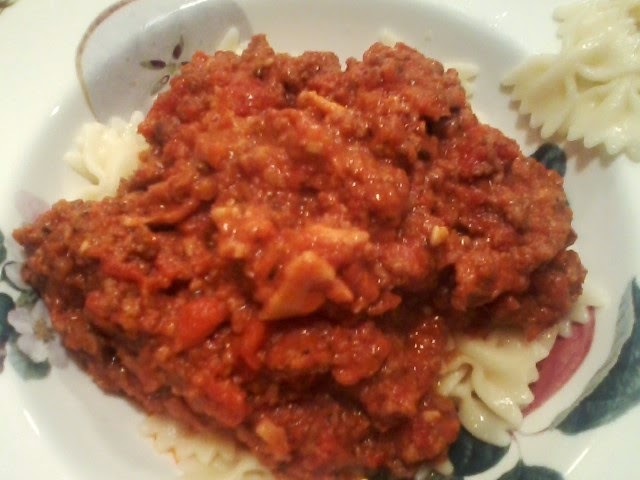 I could just eat this out of the pot, without the addition of pasta. So, if you feel like you want to line up a number of things up on your counter, let's get started. In a food processor, add carrot and pulse a few times. Add in celery, onion and garlic and pulse into a fine dice. Chop bacon or if using pancetta, cut into 1" pieces with a kitchen shears (it's hard to slice with a knife). In a heavy dutch oven, heat butter and olive oil over medium heat until butter begins to froth. 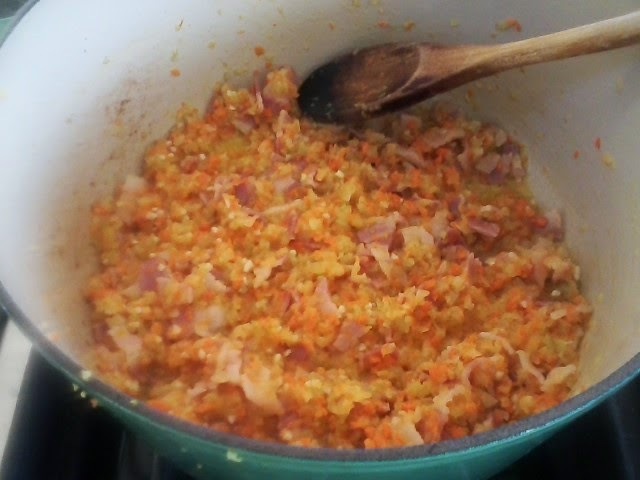 Add carrot, celery, onion, garlic mixture, along with the bacon/pancetta and cook about 10 minutes, or until bacon/pancetta starts to brown, (see below). 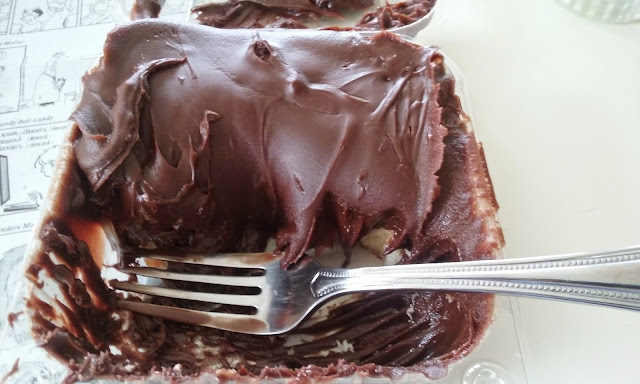 Remove any excess fat with a spoon...I just use paper towels wadded up and put in the dutch oven with it sitting on an angle until there is very little fat left, then toss the paper towels. 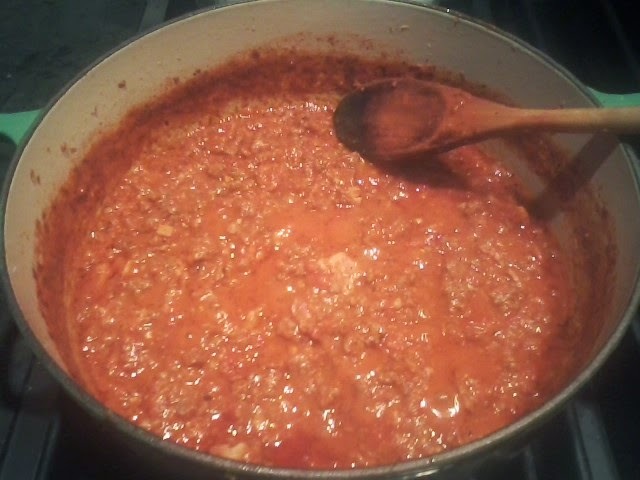 Add ground beef and ground pork and cook until the meat loses its color. 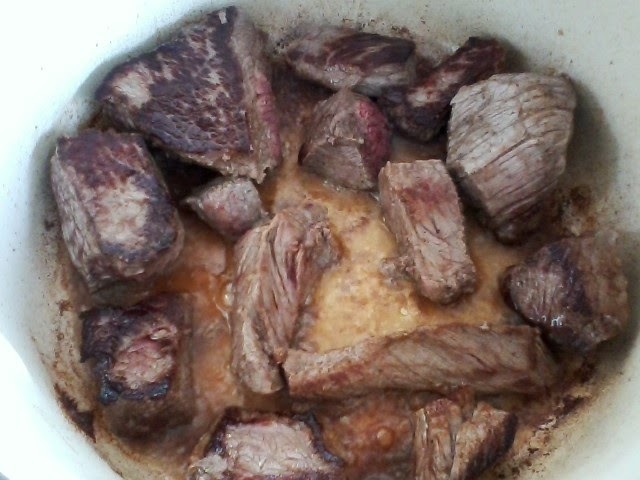 Raise heat and add wine and beef broth, continuing to cook until reduced to half. Turn heat down to simmer and add oregano, salt, red pepper flakes, basil and nutmeg and cook for about 15-20 minutes. Add crushed tomatoes and bring to a boil. Reduce to a simmer, and add milk, (when I made this batch, I had some half & half in the frig so used that...just makes it more luxurious). 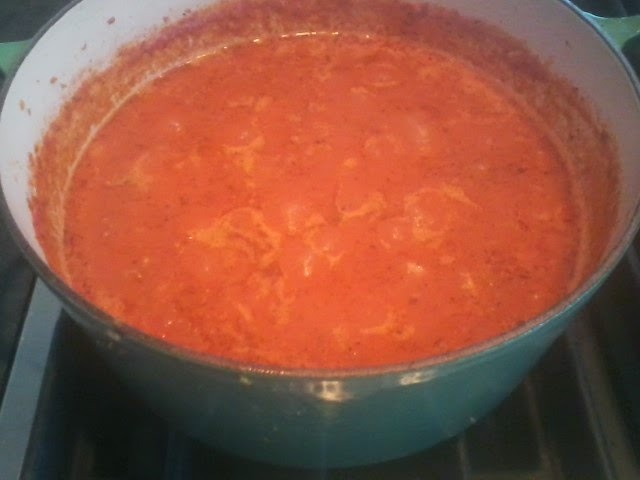 Let sauce simmer partially covered, for about 2-3 hours, letting it cook down, (see below). If you feel that the sauce is getting too dry, add another few tbsp of milk. Bon appetit! I personally am not a lover of new England clam chowder, but my neighbor, Nancy, is. 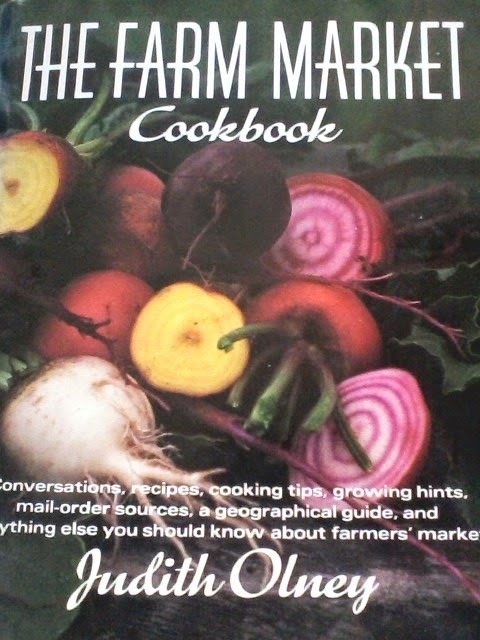 She presented me with some cleaned frozen clams and requested that I make some chowder, which I was glad to do. 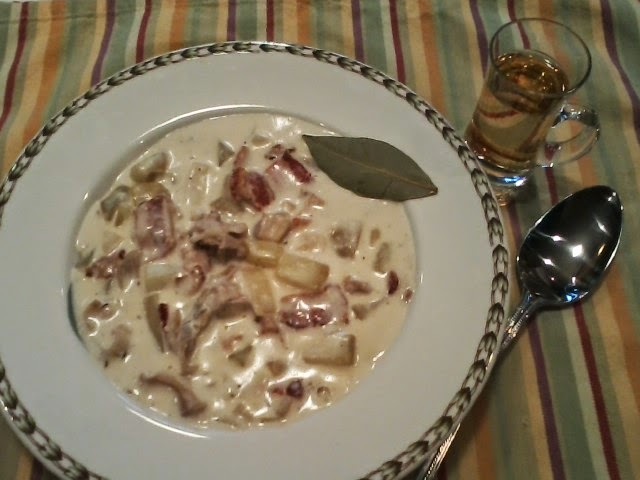 Actually, this recipe turned out really, really good...of course dry sherry doesn't hurt the process either. If you enjoy soup, you will like this one...please try it. In a large dutch oven, brown bacon until just about crisp. Remove bacon from pan, leaving the fat. 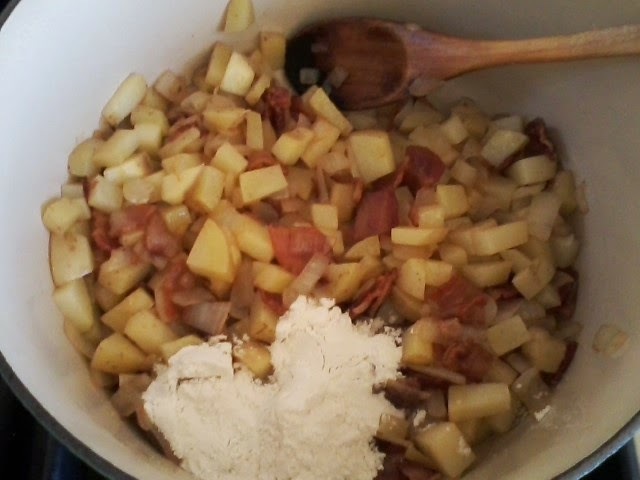 Add the onion and potatoes, cooking on medium heat for about 5-7 minutes. Add bacon back into the pan. Add salt and flour, stirring until all is incorporated, about 2 minutes. 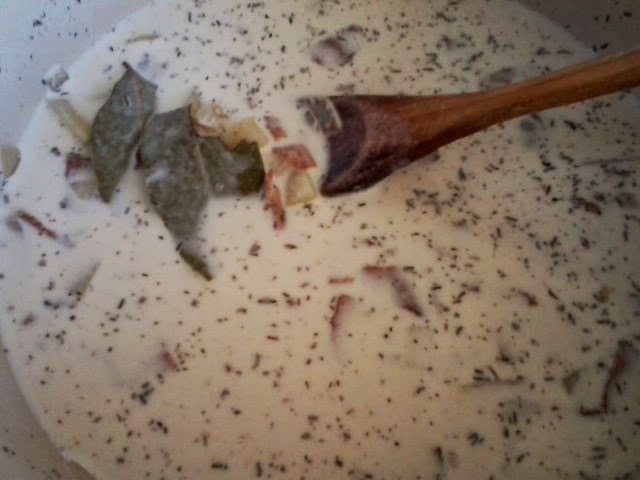 Gradually add half and half, bay leaves and thyme, keeping heat on medium, until mixture thickens. Bring to a boil and reduce heat to a simmer, cooking soup until potatoes are just about cooked through, about 10 minutes. Stir in bottled clam juice. Rinse clams to make sure all sand and grit are gone. 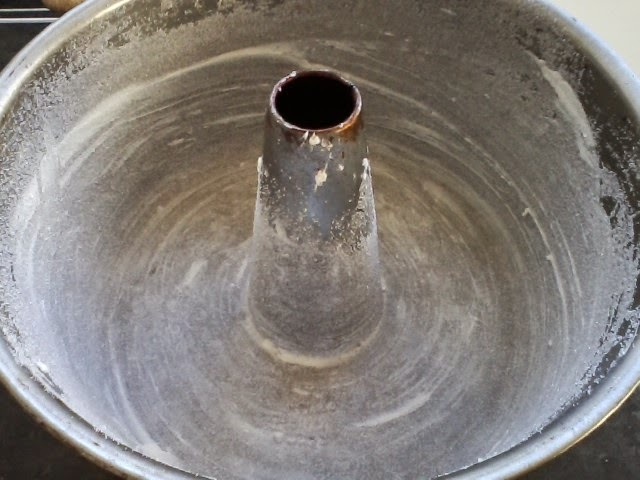 Put in a sieve to drain water. Add to soup and simmer for about 5 minutes. At this point you can add 1/2 cup sherry, tasting to see how much flavor you want it to bring to your soup. Adjust. I also put a little in a liqueur glass to accompany the bowl of soup. Bon appetit! One of My Favorite Breakfasts...What the Heck is That??? I always had an ally in June, at the Safeway in Renton Highlands. She knew "exactly" what I wanted and was happy to accommodate. One day she wasn't there, and the woman I talked to had to confer with the bakery manager, who said they couldn't do it. I asked why not, and said I had no problem paying extra for my special request. So, he did it, and tacked another $2.00 on to a 50 cent donut. I left, but not before talking to the manager of the store about the lack of customer service in the bakery department, and when, on a rare occasion that I requested this, why wouldn't they be happy to do it, and at no charge? So, I would switch out where I went, and sometimes visited the Newcastle Safeway. The woman in the bakery department who helped me had medical issues, and sometimes was not the most pleasant. I would always make sure to ask how she was feeling, but sometimes she made it known that it was a monumental task, such as manual labor. There were even times I called ahead, so I wouldn't bestow myself upon her to this "unsavory" task on the spot. But, that didn't work out so well either, because she would completely forget, and then was even more bothered because she forgot and had to to it right then and there. At the same Safeway in Newcastle, there was a young guy who had never did this special order before. Now mind you, it's not rocket science. 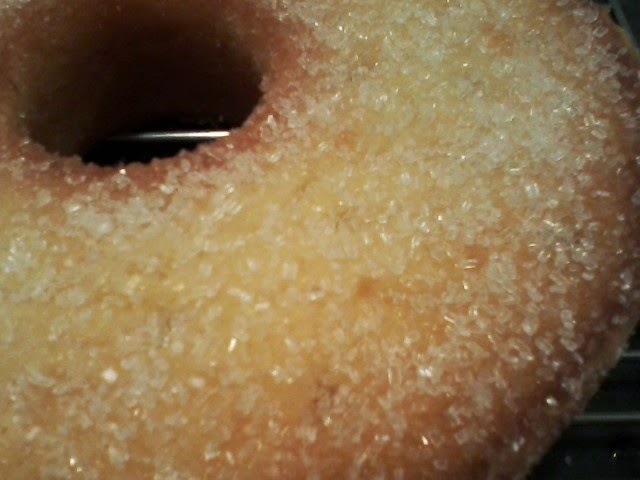 So the guy went back and put more icing on top...about 1 tsp to be exact. Told him, "sorry, that isn't enough", to which he looked at me and went back again. After sending him back a second time, he closed the lid and threw the container, donut, chocolate and all, on the scale and said "it weighs 1 1/2 pounds...that enough chocolate for you?" to which I replied..."perfect, thanks." He really thought he had my goat, but I just took my container and left. The best scenario, though, was the time I went to the Safeway here in Des Moines. Angie, who works in the bakery department, understands completely my need for an occasional chocolate binge...her counterpart, one time, not so much. 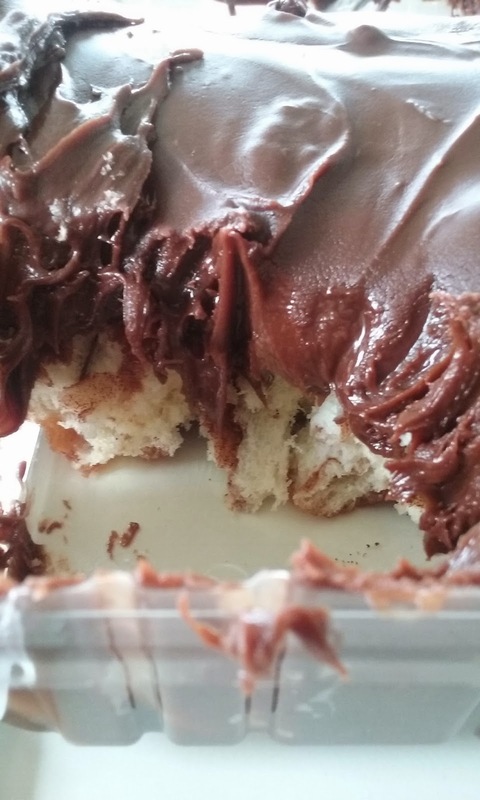 I handed her my donut and let her know what I wanted, and her reply was "it already has chocolate on it" to which I replied, "I would like more, if you could please put enough on so that it fills the bottom of the container" to which she replied, "there's already a lot of icing on it, and you want more?" to which I replied, "yes, and I just told you what I wanted." With a totally astonished look, she went back and, unfortunately, had to go back again, because I think she was convinced I didn't know what I was talking about. So, up to the checkout line I went, asked for a manager, and told him that I really didn't want to pick a fight with his employee, I simply wanted more icing on my donut, and it really wasn't up to her to argue with me what she thought was appropriate...after all, she wasn't eating it, I was...free donut that day. 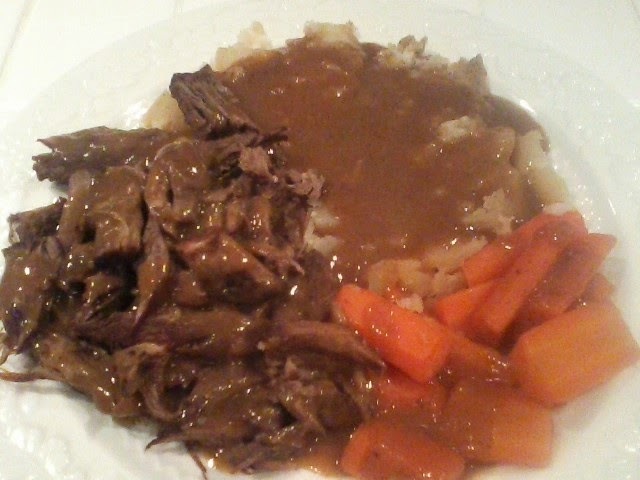 Recipe #75: My Mother's Pot Roast...Not Much to It, But Lot's of Flavor!! I remember as a little kid, my mom making pot roast. It was one of "the" best meals to have on a fall or winter day. You know what...I love making pot roast any time of year. But, the one thing I do that my mom didn't was cut the chuck roast into pieces. I am very picky about my fat and grizzle, so sort of go through the roast before browning. Also, mom browned the pot roast in hot bacon fat, and that's where a lot of the good flavor comes from. Mind you, not a lot, just enough to brown the meat and pick up a little of the bacon flavor. If you want a simple dinner, this is it! 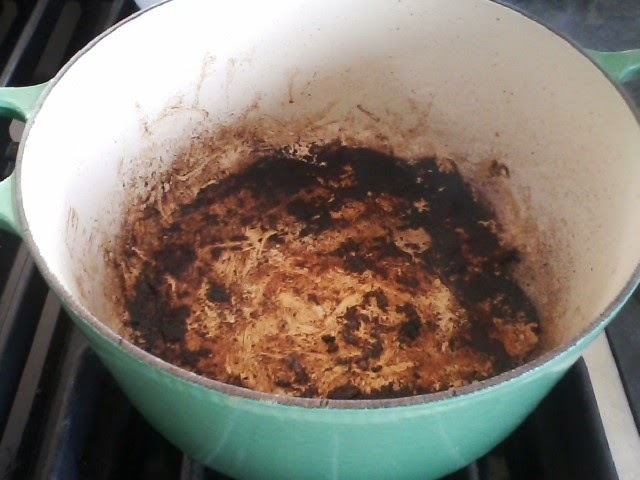 In a large dutch oven, heat bacon fat on high heat. I usually have my pot roast cut into 6-8 pieces, with some odd slivers. Add all to the pot and sear, and sprinkle with salt, pepper and garlic salt. Brown on other side, and repeat with seasonings. If there is any bacon fat left, just blot with a napkin...do not rub out. 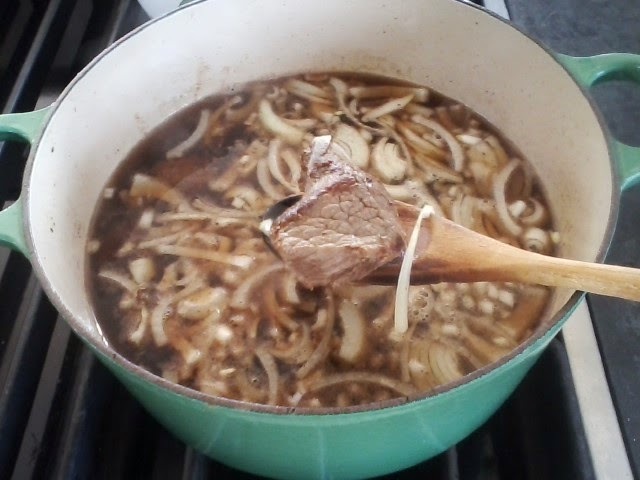 Add about 1 quart of water and stir the brown bits from the bottom of the pan...enough to cover the pot roast, stir in the onion, cover, and put heat on low. Check a few times over the course of 3 hours, adding water to keep top of roast covered. 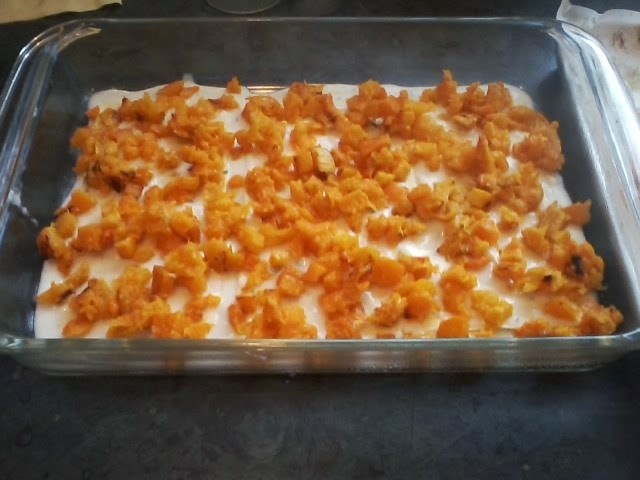 After 2 1/2 hours, add carrots and potatoes, raising heat to medium. Cook for a half hour. Remove everything to a plate. 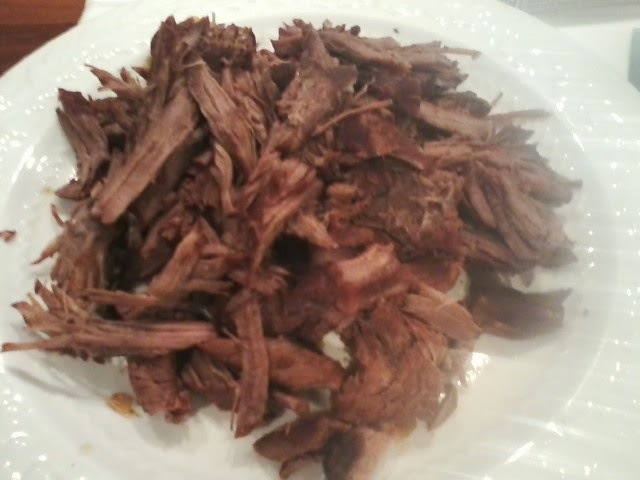 At this point, I shred the pot roast instead of slicing it..just personal preference. Make the slurry with the flour and water. Juice in pot roast pan should be boiling slightly. Add the slurry, stirring constantly. Don't worry if there are lumps...I always put my gravy through a sieve. You may also do the same with cornstarch and water, but make sure the water is cold, otherwise...no gravy. Serve the pot roast with the carrots and potatoes. My dad always liked egg noodles instead of potatoes. Bon appetit! leave the brown on the bottom of the pan...great flavor..
United States, France, Germany, Slovakia, Poland, Ukraine, Singapore, Thailand, Malaysia, Korea, Taiwan, Guam, Indonesia, Spain Australia, Romania, Turkey, Italy and China. I am continually trying to improve my blog, and would love to hear from you, my viewers and friends. On the bottom of every post, there is a place to put a comment. It will either say "no comment" or "one comment" etc. Just enter on that and you will be able to comment on a story or a recipe. Comments have been very few, and they help me, the blogger improve my site. Have you made a recipe? Have you made a recipe and really enjoyed it? If you did make a recipe, was there something you didn't understand, or didn't care for? Is there a recipe you would like to make, but are at a loss? Please let me know, and I will do my best to make it, complete with pictures so you will be able to see step by step how to do it. 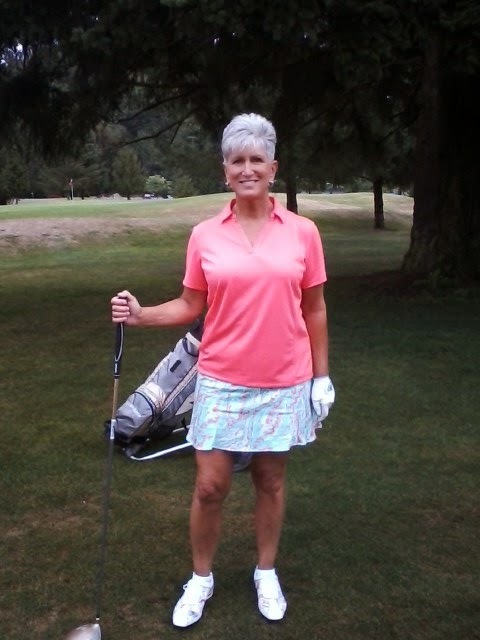 Here are some pictures of me...I'm 58 years old, and live in the Seattle area. 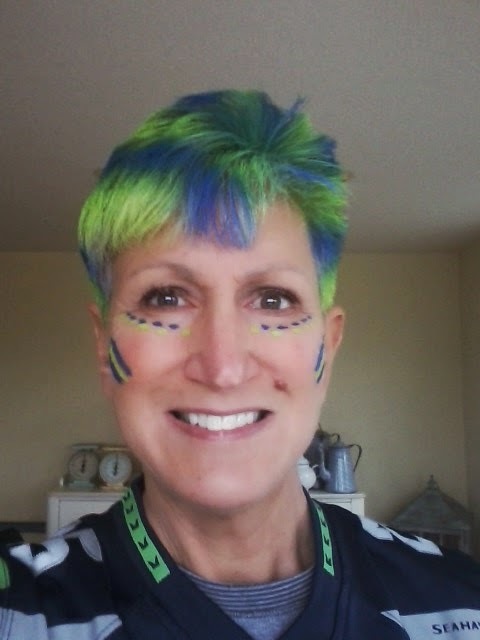 I worked for United Airlines for 37 years and retired last year. I have always loved to cook, and enjoy entertaining my friends. You are one of those friends, even though you may be thousands of miles of away. You can also email me at witt13@comcast net. I was the only planned child of the three of us...my sister, Pam, being 61 and Michael, 57 (on May 24 actually). My brother and I are only 13 months apart. My mom was 10 years younger than my dad, and she was 19 and he 29 when they were married. I would imagine that back in the 50's, that was much more eyebrow raising than it is today. My mom worked part time, which, back in the 60's, when my father was working full time, was not that common. 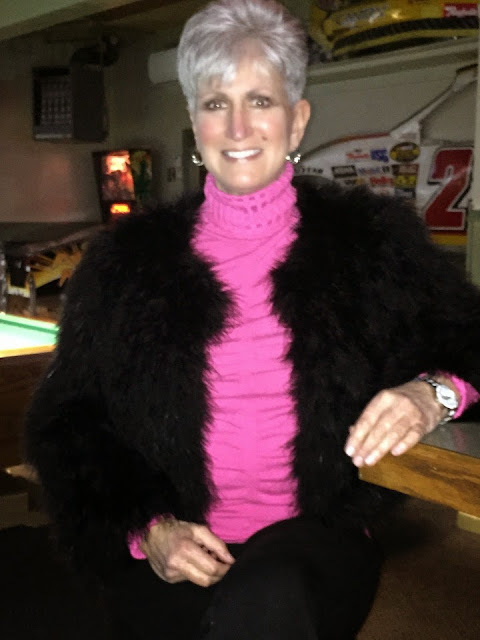 She worked at Sears for nearly 30 years and her hours were from 5 pm to 10 pm. She would always get dinner on the table for all of us before leaving for work, and we ate as a family until we became teens, and then of course, things got a little scattered with schedules. 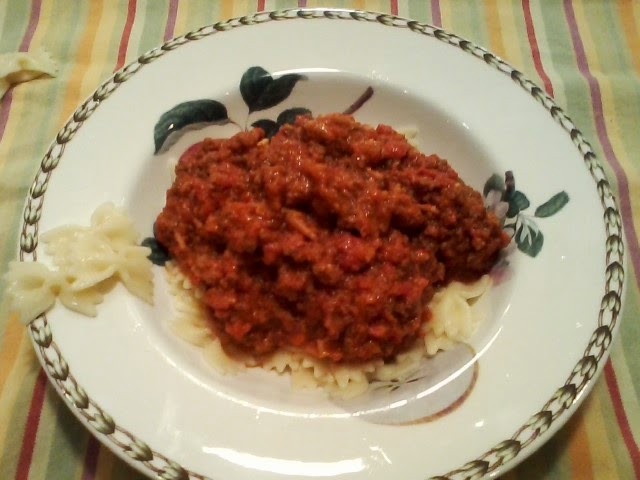 My mom was not a chef by any means, but was a very good cook and made a variety of things. We would have pork chops, ribs, fish, lamb, and all dinners usually came with mashed potatoes and a vegetable. While the veggies were canned or frozen, the mashed potatoes were always real potatoes, whole milk and butter with salt and pepper. If there was one attribute that my mom instilled in all three of kids, it was fairness. She never favored one child over the other, which is how it should be. We would have the same amount of presents at Christmas, the same amount of trinkets in our Easter baskets, etc. To this day, I am this way, and when I visit my two nieces, Alex and Abs, I make sure everything is exactly equal. I remember my mom used to iron our underwear. Even though she knew no one would see it, she thought we would feel better. When any of us were sick, she would set up the tv tray, and bring us toast and tea in bed...sometimes my dad would even bring in the tv to our room...both of these were so special. Sadly my mother died in 2002 of multiple myeloma. When she went to doctor not feeling well, she was already in stage 4 of the cancer. It was absolute hell for my mom the next year, and she died when she was 67. 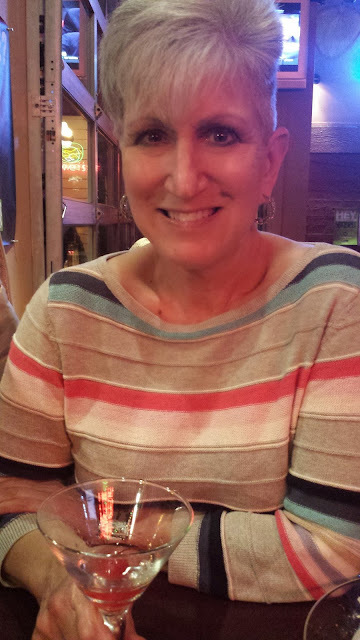 I would talk to my mom pretty much every day on the phone after she was diagnosed. She would tell me that she would say multiple rosaries every day, how retched the chemo was, and that she would visit me when she got well, which I would have hoped would be the case, but knew better. The night before I was to fly to Chicago to visit her, I had talked to her on the phone, and she wasn't doing well. After our conversation, I remember that I hadn't told her I loved her. I called the hospital back and asked the nurse to please let her know. Afterwards, I just sat on my front porch, and through many tears, sitting by myself, told my mom through my thoughts that it was okay if she died. I was supposed to fly out the next morning, but something told me to stay put. I got a call an hour later from the nurse letting me know my mother had died. Perhaps she had wanted my okay, and if she did, I was glad I was able to read her thoughts the night before. Every time I go back home to Chicago, I visit the cemetery where she and my dad are. I clean the gravestones, sit on the grass, and through tears, keep them company for awhile. I always hate to leave. Heat oven to 325. Generously butter a 10" tube pan. 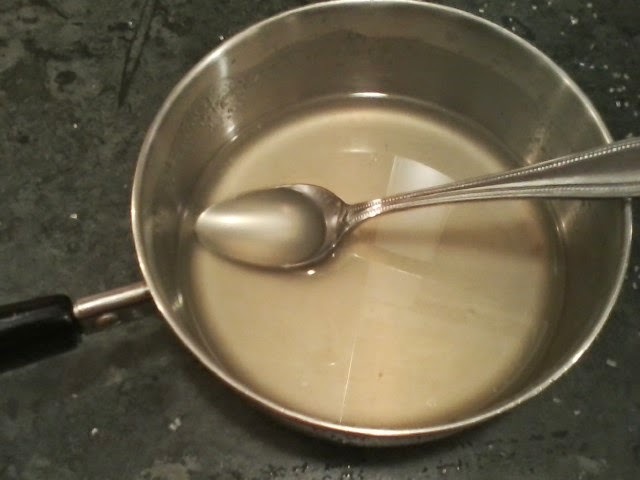 Add a small scoop of sugar to the pan and rotate all around until a thick coat adheres to all sides, (see below). Place the cream cheese and butter in a mixer and cream until blended and fluffy. Gradually add the sugar and continue beating. Let the sugar feed in slowly and whip it for 5 minutes to incorporate fully. Add the eggs, one at a time, and beat for 1 minute after each addition. Add the lemon zest, 1 tbsp of the lemon juice, the lemon extract and the salt. At low speed, add the flour and mix just until blended. Pour the batter into the prepared pan, (it's great raw, by the way). Bake for 1 hour, or until a toothpick inserted in the middle comes out dry. 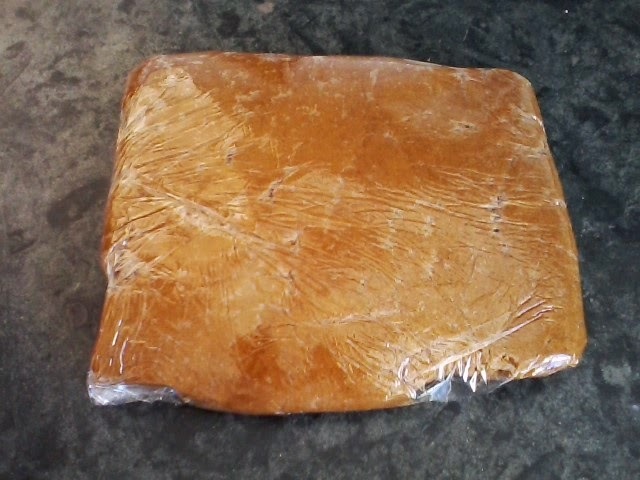 Ten minutes before the cake has finished baking, make the syrup. Place the sugar, water, lemon extract and the remainder of the strained lemon juice in a small saucepan. Bring to a boil, then simmer for 5 minutes until the mixture is syrupy. Take the cake from the oven and immediately poke 2 row of holes around the cake with a bamboo or shish kabob skewer. 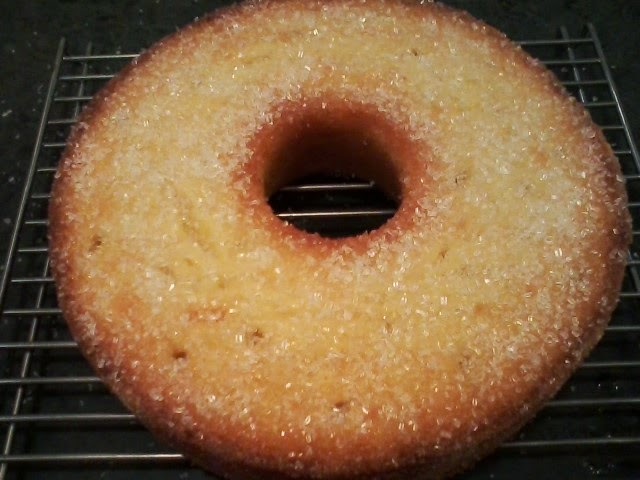 Spoon half of the lemon syrup over these holes and let it absorb. 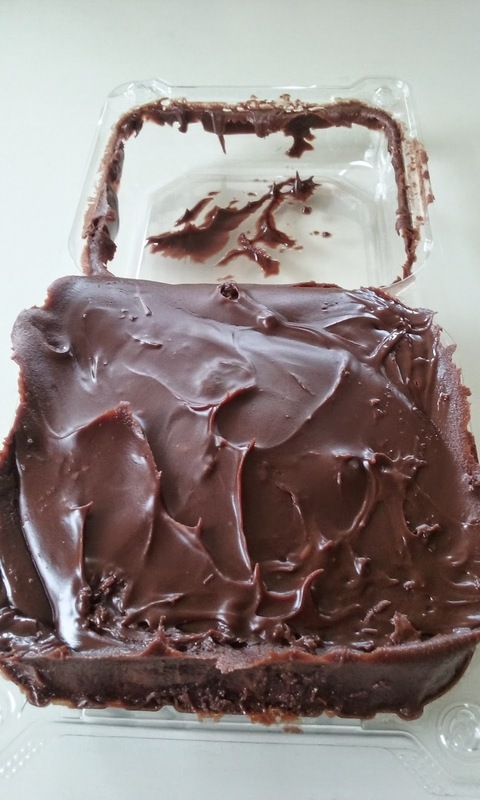 Cool the cake for 5 minutes, then run a knife around the mold and turn the cake out onto a cooling rack. 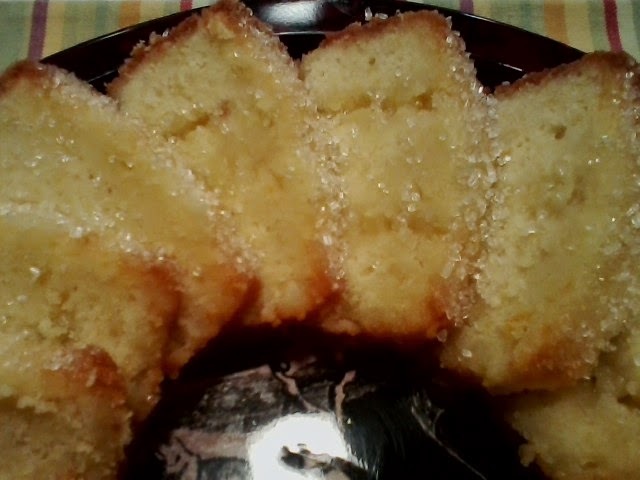 So now with the cake on the bottom, do the same thing with the holes and syrup. It should soak in much more quickly on this side. Turn cake back over and let cook on a rack. When placing on a plate after cooled, you will need to be careful, as the cake will be sticky and somewhat soft. I use a pancake turner or large offset spatula to bring the cake from the rack to the plate. 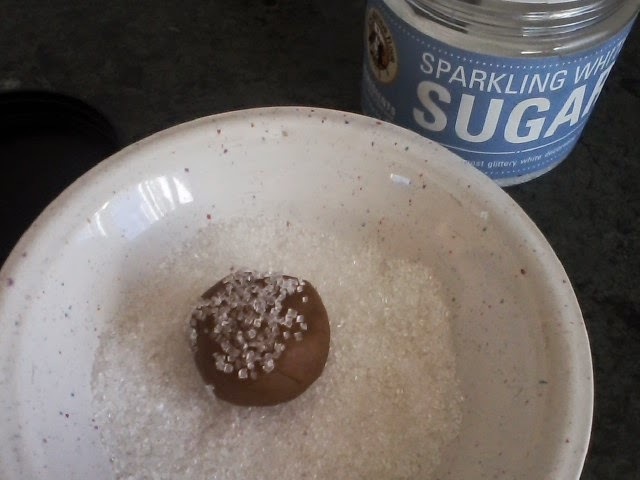 I then spoon about 2 tbsp sparkling sugar (see below) all around the top of the cake. It gives it a really nice crunch and some sweetness that offsets the tart of the lemon. Bon appetit! 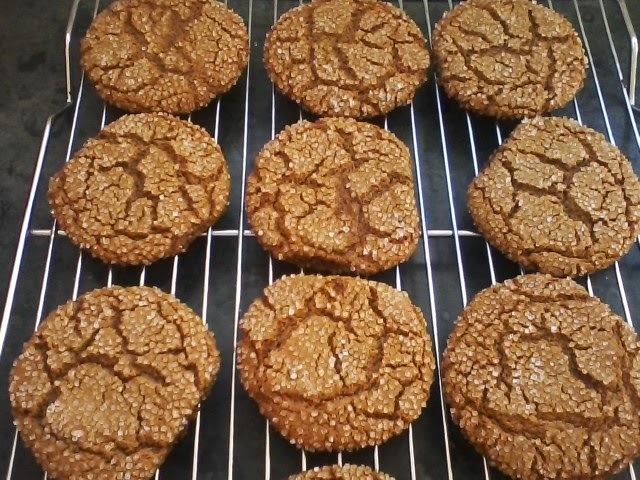 Recpe #73: My Own Ginger Snaps...Fantastic & Low Fat to Boot! I don't make these cookies that often...why? You should know the answer to that..because I'm a chocolate person. But, every once in awhile, I feel like something 180 from chocolate, and this is the cookie. Even though it represents fall, this cookie is great any time of year, and especially crumbled over some vanilla ice cream. They're great, so please try them. 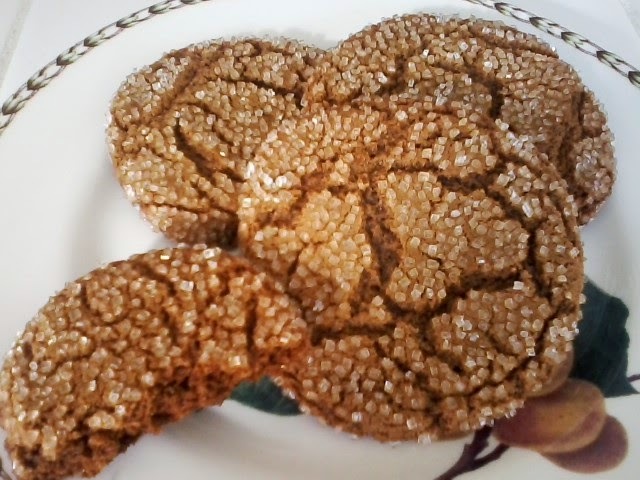 Just fyi, for this particular recipe, I used my sparkling sugar for a bigger sugar crunch. Cream butter and 2/3 cup sugar, beating at medium speed with a mixer until light and fluffy. Add molasses and egg and beat well. Combine flour with baking soda, ginger, cinnamon, clove and salt. 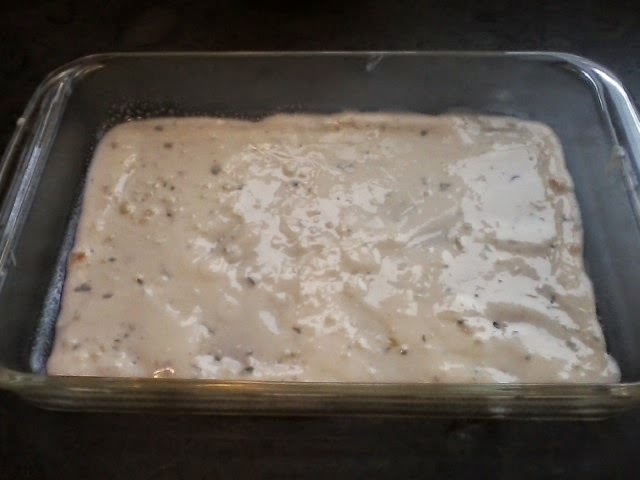 Gradually add to creamed mixture until well blended. Put dough on a piece of plastic wrap, cover loosely, flatten somewhat with the palm of your hand, and freeze for about 30 minutes. Take out of freezer, and roll into about 1 1/2" balls, and roll in remaining sugar. 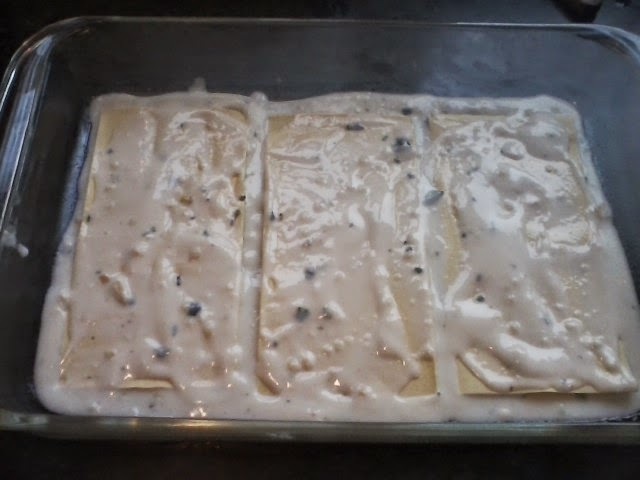 Place 2" apart on cookie sheet lined with parchment paper. Bake at 350 for 10-12 minutes, erring on the lesser amount of time, just until lightly browned. Remove from sheet ad cool on wire rack. The middle should be soft to the touch, even after the cookie has cooled. Bon appetit! If you were to ask me what the one thing is that I always in my freezer, I could answer that in a heartbeat...BUTTER! 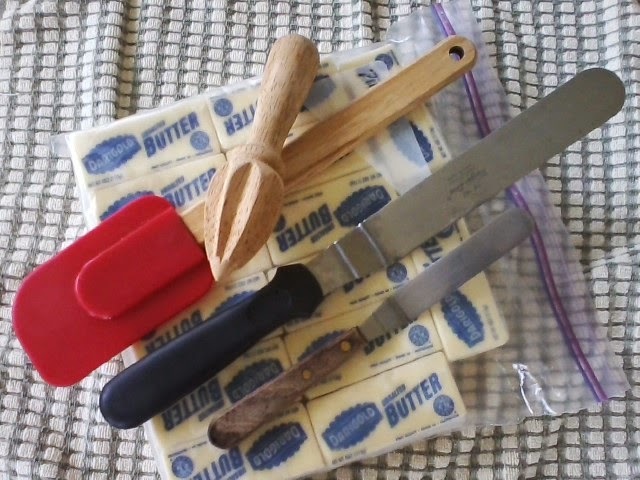 At any one time, I have 8-10 pounds of butter in the freezer, all tucked nicely away in freezer Ziploc bags. If you were to also ask me if I use unsalted or salted butter, the answer is just as fast...unsalted. The shelf life isn't as long as salted butter, but if it's in the freezer, what does it matter? Unsalted butter lacks two things...salt, and annatto, which adds color to the butter. I think the lowest my butter inventory has ever gone was this past Christmas when I was down to 4 sticks in the freezer, not 40. If butter's on sale for $2.00 a pound at my grocery store, and the limit is 2, I will ask the dairy manager if he can okay my taking 8 boxes...and I've never had a problem...I love butter, and it brings me much joy to see it in its glory in the freezer. But, enough about butter and on to my other items. My large red rubber spatula...oh my gosh, can I tell you how difficult it is to find a fairly stiff large spatula that can go through a lot of dough that's in the Kitchenaid? I think I got it at an outlet mall, but now I honestly can't remember. I should have bought 3 of them...don't know what I was thinking. Not pictured, but still getting recognition is my very small heat resistant hard plastic spatula. I use it to scramble my eggs and scrape the pan when I'm melting things like butter or a chocolate mixture. It has held up for years and has served me well. On to my wooden reamer. This tool serves two purposes. Yes, it reams juice from fruit and I use it alternately with my vintage glass reamer, but it's bigger purpose is to create the hole in the middle of my jam thumbprints before filling, using the handle end, of course. It is the perfect size, and never sticks to the dough. I have already featured the jam thumbprint (recipe #37), and if you get your hands on one, it will make that particular job much easier. Last, but not least, are my two offset spatulas, large and small. When I bought the large spatula, I thought long and hard before buying it. No, it wasn't the expense, I simply questioned whether I would have any use for it. That was answered with my very next baking venture, when I had to lift a rather large piece of cake from a pan to a plate. Viola! and the project was done. It has saved my baking hide many times over. As far as my small offset, I think I have had it for 30 years. If you do a fair amount of baking, and you only have a small flat metal spatula, run, don't walk, run, to the nearest Joann's, Michael's, etc. and treat yourself to this invaluable tool. They are both so talented at getting under things that a flat metal would tear apart. Well, there you have it...number 8 in a series of things I can't do without. 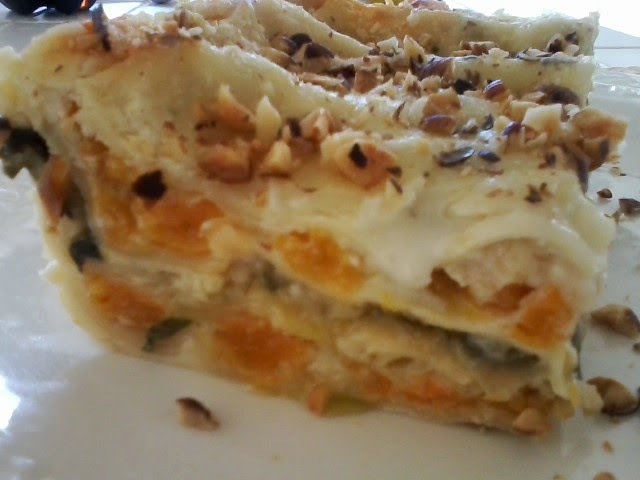 I have always liked the concept of butternut squash lasagna, but had never made it. 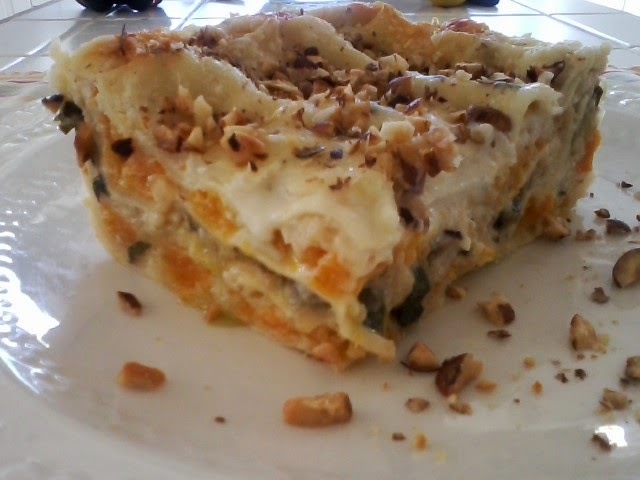 Granted, there were many other things I incorporated butternut squash into, but I guess the thought of putting it in between lasagna noodles without the benefit of meat just didn't appeal to me. Well, I will be the first to admit I'm glad I finally ventured out and put this recipe together. 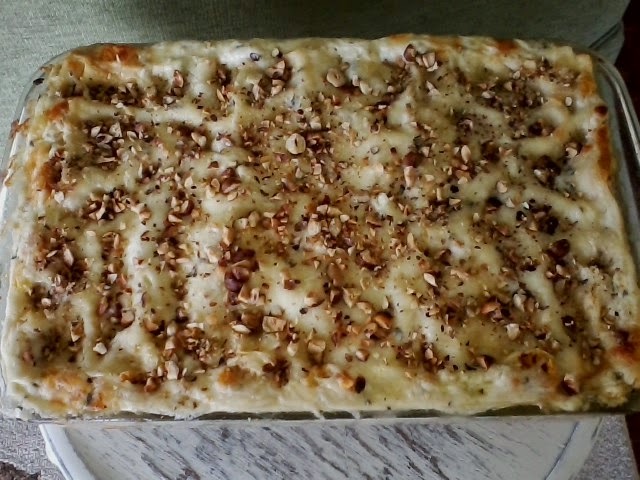 It is rather rich due to the sauce, but, gosh, it's lasagna, after all. * there are many methods of toasting hazelnuts, so as to get all the skins off...please look up online to see which method you prefer. I roast them in the oven at 350 for 10-15 minutes, then take out of the oven, place in a dish towel, cover all the nuts, leave them sit for a few minutes, then roll them around in the dish towel. most of the skins will come off, but don't worry about those that don't..
Heat oven to 450. 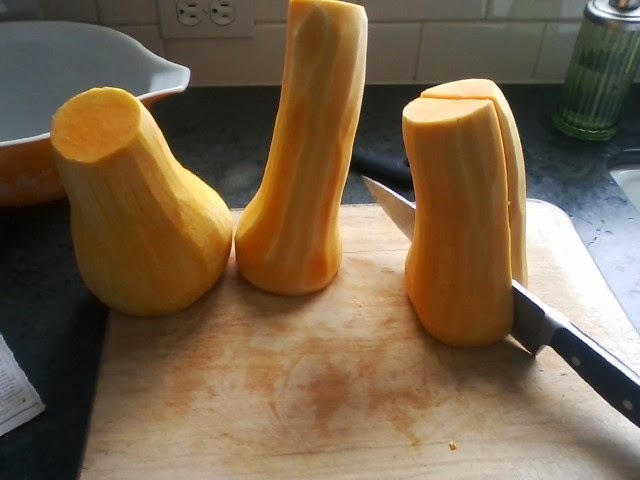 In a large bowl, toss the squash with 1 tbsp olive oil and 1/2 tsp salt. Place squash on a large rimmed parchment-lined cookie sheet and roast in oven for about 30 minutes, turning once or twice. 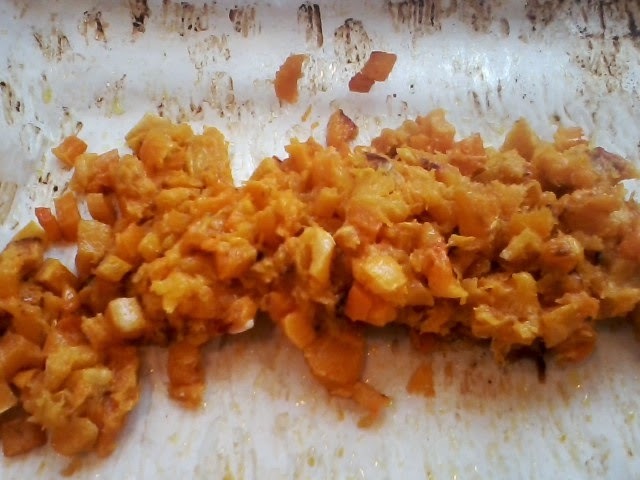 Remove from oven, and mash lightly, leaving some squash in chunks. In large skillet, add remaining tbsp olive oil and 1 tbsp butter. Over medium heat, add the onion and cook for about 10 minutes, or starting to brown a little, stirring often. 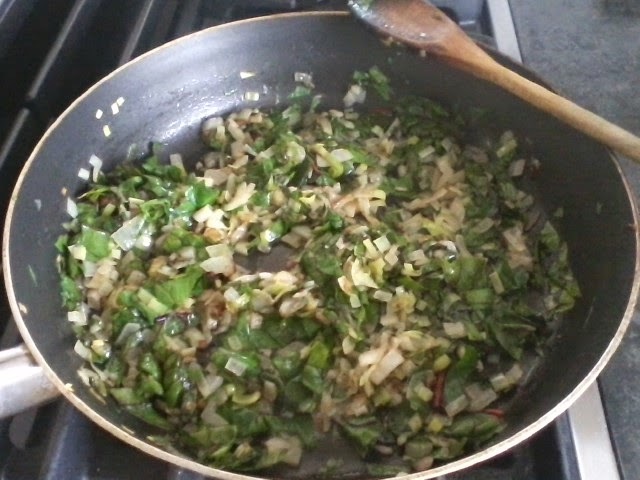 Add the chard and another 1/4 tsp salt and cook until the chard is wilted and the liquid evaporates, 5-7 minutes. Remove from heat, add 1/2 cup hazelnuts and set aside. Lower heat to 375. In a large saucepan, melt the remaining butter over medium heat. Whisk in the flour, pepper and sage and cook for about 1 minute, stirring constantly. 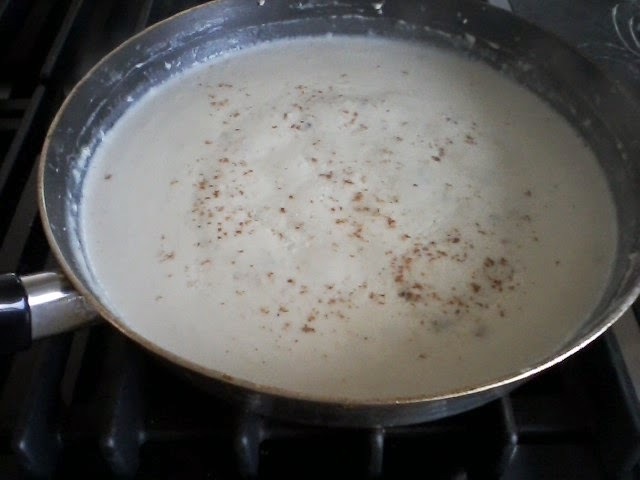 Gradually whisk in milk until smooth and cook the white sauce over medium-high heat until it boils and starts to thicken slightly, continuing to whisk frequently. Boil for an additional 2 minutes while stirring, then whisk in nutmeg and 1/4 cup parmesan cheese. Remove sauce from heat. 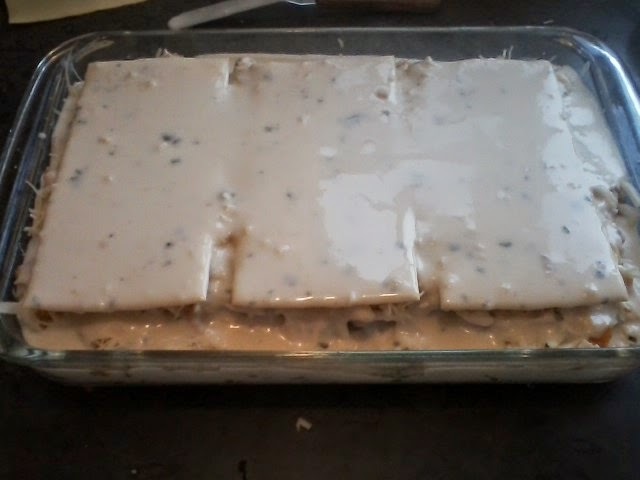 In a 9x13 pan (I use glass), spoon aout 1/2 cup of the white sauce to cover the bottom of the pan. I use an offset spatula to spread. 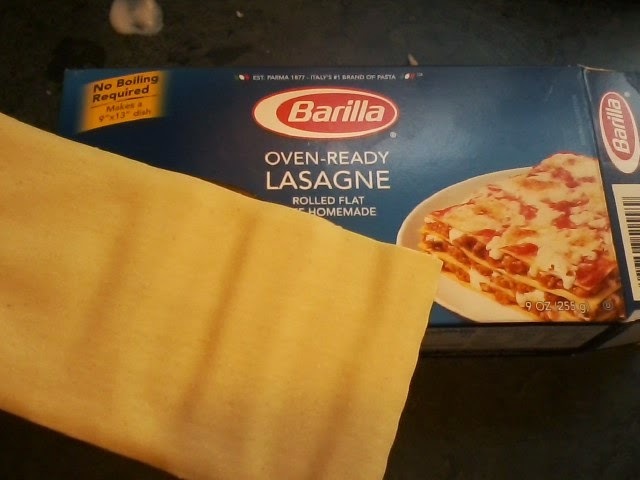 Arrange 3 lasagna noodles over the sauce. 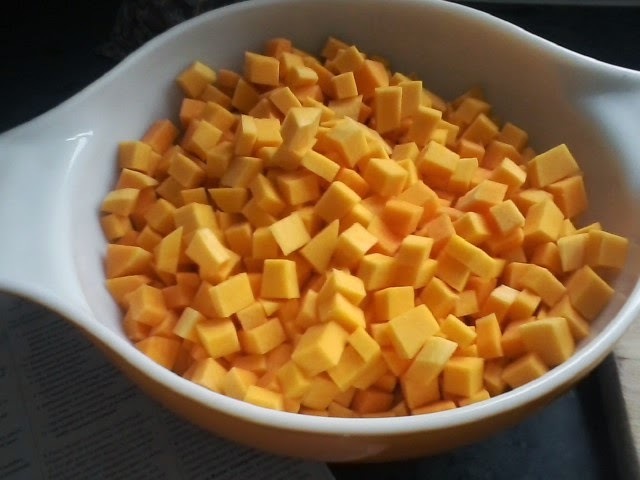 Spread half of the butternut squash over the noodles, then a quarter of the mozzarella, then one cup of the sauce. 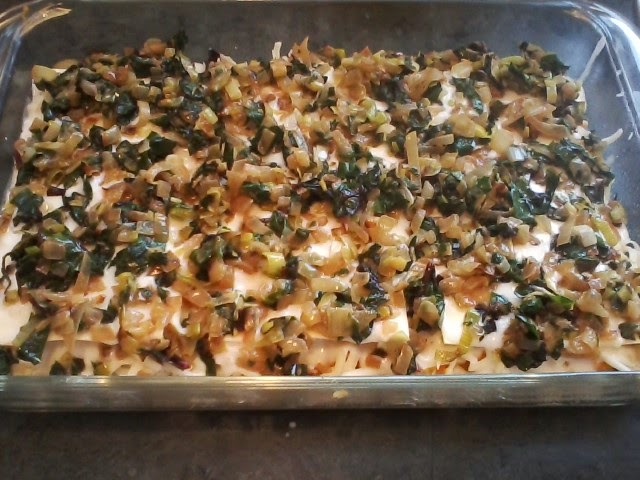 Noodles, the swiss chard/onion mixture, mozzarella, sauce. 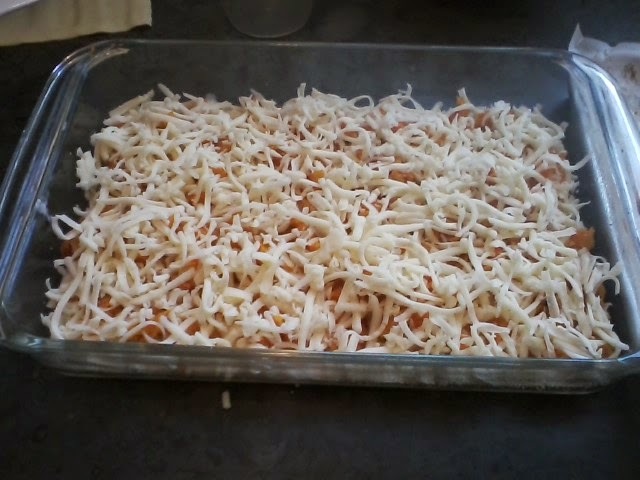 Noodles, the remainder of the butternut squash, mozzarella, sauce. 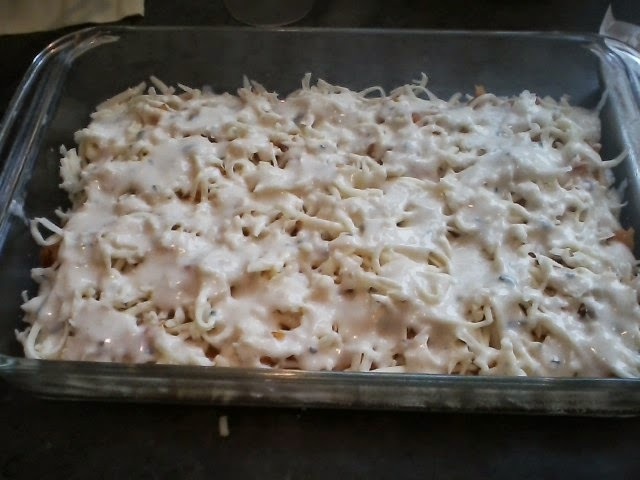 Noodles, remainder of sauce, mozzarella and parmesan. Tightly cover with foil sprayed with cooking spray so cheese doesn't stick when you take off. Bake at 375 on center rack for about 40 minutes. Uncover and bake another 10-15 minutes. Take out of the oven, sprinkle the remainder of the hazelnuts over the whole pan, and let sit another 15 minutes or so before cutting. Bon appetit! Hey, Hey, It's Derby Day!